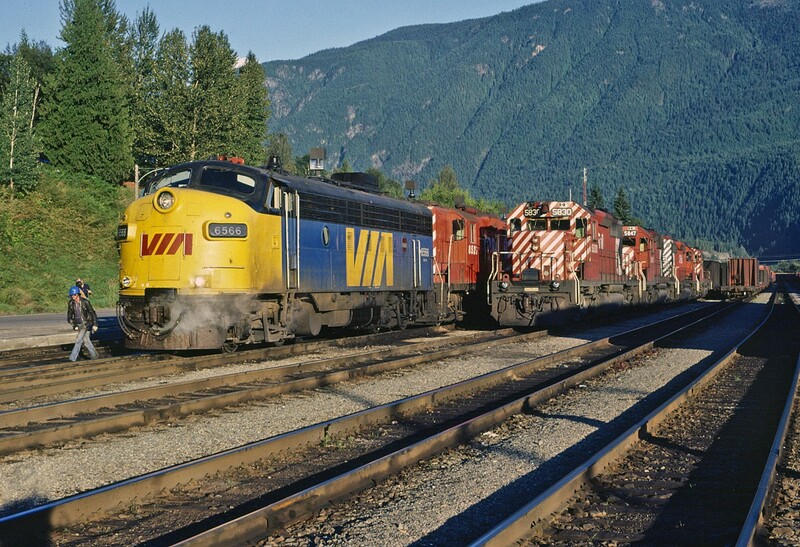 Railpictures.ca - Steve Bradley Photo: Busy time and a great array of power at Revelstoke. 651, a westbound sulpher train is cutting off the 5830 and it will head to the shop. With 5847 leading, 651 head to Kamloops following Via 1. With the Laggan and Mountain Subs behind her, 651 no longer needs the extra 3000 horses. While this is occurring, VIA 1 is being watered and serviced and quite likely, and number of passengers are stretching their legs and taking in this gorgeous mountain evening. | Railpictures.ca – Canadian Railway Photography – photographie ferroviaire Canadienne. Caption: Busy time and a great array of power at Revelstoke. 651, a westbound sulpher train is cutting off the 5830 and it will head to the shop. With 5847 leading, 651 head to Kamloops following Via 1. With the Laggan and Mountain Subs behind her, 651 no longer needs the extra 3000 horses. While this is occurring, VIA 1 is being watered and serviced and quite likely, and number of passengers are stretching their legs and taking in this gorgeous mountain evening. Looking forward to seeing them Steve. I went through here on Sept 24, 1988 on VIA’s ‘Canadian’ and was awestruck with the scenery. It would also be great to see some of your Newfoundland images too! Thanks for your kind comments gentlemen. It sure was a colourful and interesting time around CP in those days. It helped no end that I was working as a CP brakeman out of Revelstoke at the time, and no one cared if you had a camera. Once No.1 left, I climbed aboard 5847 and headed to Kamloops. I’ll dig out more slides and scan them.